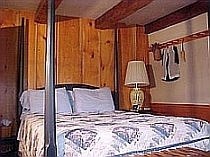 The Blue Room has a queen size, pencil post bed with a comfortable firm mattress, down comforter, and a handmade quilt. 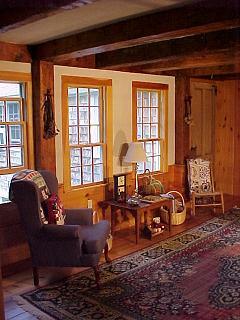 The original hand hewn ceiling and corner beams are complemented by wide pine paneling on the walls and floors. The room is also furnished with an antique luggage rack that sits at the foot of the bed, a corner cupboard contains cable television with easy viewing from the comfort of your bed and a high-backed sitting chair with an ottoman and its own reading lamp is a nice place to while away the time. Western exposure allows for the enjoyment of beautiful sunsets. Details such as shaker peg boards, oriental rugs and a fireplace complete the picture of colonial elegance with modern comforts. Air conditioning is available during the summer months. Enjoy free Wi-Fi. The Blue Room shares a bath and a sitting room with the Red Room.